ENDOR™ Cream is for reducing the symptoms of mild to moderate skin disorders, such as eczema, itchy flaky, white capped skin & rosacea. ENDOR™ cream may reduce the irritation of insect bites and itchy skin due to atopic eczema. ENDOR™ Cream is specially formulated to be gentle on the skin, provide a protective barrier, allowing the natural healing processes to occur. For babies, children and elderly, we recommend that ENDOR™ cream is used to reduce the symptoms of mild to moderate skin conditions. If symptoms persist, talk to your healthcare professional. You may always contact us for more information. 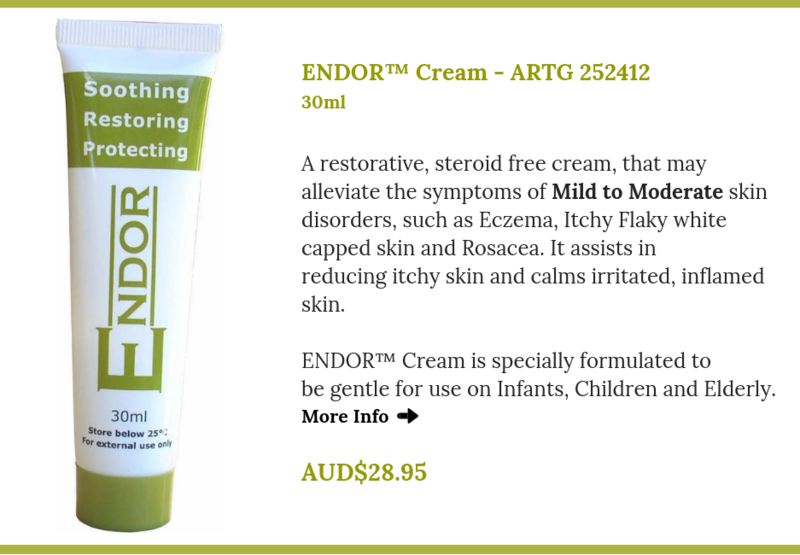 In our blog you can find the list of FAQ about ENDOR™ Cream. Please click here to read it. You can apply ENDOR™ Cream all over your body including your face and scalp. It may also be applied on your ears and your eye lids, but do not get into the eye. These products are for external use only. To be applied on skin with symptoms of eczema, itchy flaky white capped skin and rosacea or small skin blemishes. You may also apply it on insect bites to reduce the symptoms of the insect bite. For best results, apply ENDOR™ Cream at least twice per day. If symptoms persist, please talk to your healthcare professional. For information regarding Best Results, please click here.